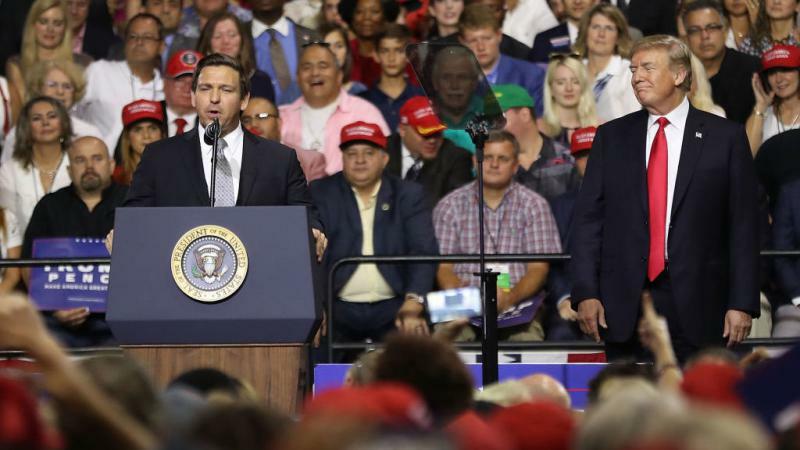 Andrew Gillum and Ron DeSantis. The 2018 campaign for governor is an epic contest involving candidates with starkly different visions for the future of Florida. DeSantis has sought to define Gillum, who supports expanding Medicaid, raising teacher salaries, and abolishing Immigration and Customs Enforcement (ICE), as a socialist extremist. But the latest polls show a tight race, with Gillum holding a slight edge. Both Stipanovich, a Tallahassee lobbyist who was chief of staff to former Florida Governor Bob Martinez, and Fernand Amandi, a Democratic pollster with the Bendixen & Amandi consulting firm, said Friday on The Florida Roundup that the gubernatorial race between Gillum and DeSantis is the most interesting in memory. Among the issues most discussed so far on the campaign trail is the environment -- and specifically a current crisis in Florida's waterways. Beaches in Palm Beach and Miami-Dade County were closed Thursday due to red tide, which means the toxic algae is now affecting waters from the Panhandle to both of Florida's southern coastlines. It has killed thousands of fish, sea turtles and manatees. That’s in addition to blue-green algae blooms that have spilled over from Lake Okeechobee into waterways on both coasts. DeSantis, a former member of Congress, has worked to position himself as an environmental champion and has said he’ll use his Washington D.C. connections to speed up the building of reservoirs south of Lake Okeechobee to restore water flow and prevent toxic algae blooms. He also said he supports a ban on fracking and drilling off the coast. Stipanovich said DeSantis is clearly trying to distance himself from the past 20 years of Republican rule on environmental issues in Florida, including from current Gov. Rick Scott. Gillum, the Mayor of Tallahassee, has called DeSantis an “election year environmentalist,” suggesting his environmental record in Congress does not match his claims. DeSantis scored just 2 percent on the League of Conservation Voters environmental scorecard for his three terms in Congress, which means he voted against the environment 98% of the time while in office. Gillum has called for Florida to become a global leader in responding to climate change. He wants to reduce carbon emissions and transition to renewable energy and touts a record of environmental reform. For instance, Tallahassee got a 120-acre solar farm earlier this year. Early voting starts three weeks from tomorrow, on Saturday, Oct. 27. According to the Florida Division of Elections, more than 2.7 million voters in the state have requested mail-in ballots for the Nov. 6 general election. That exceeds the total for the 2014 midterm election; 3.3 million ballots were mailed out for the 2016 presidential election. President Trump is scheduled to appear at a fundraiser with DeSantis later this month, when early voting begins. Both analysts agreed that the weeks-long showdown in the Senate over U.S. Supreme Court Justice nominee Brett Kavanaugh is unlikely to have any long-standing effect on the governor’s race. People will forget the Kavanaugh saga soon enough, Amandi said. “A news cycle lasts 25 minutes in Trump’s America. So I think the resonance won’t be as much a month from now."